Pinspot lighting is used all the time to originate from above and shine a tight beam on your centerpieces. This brings your centerpieces to life. The same can be done for the cake or in this case, cup cake table. When your attending your next indoor wedding try to find the cake table as quickly as you can. Then imagine one or 2 pinspot lights hitting it. It’s a world of difference. It takes the cake out of the background and make it the centerpiece. Our brides were frustrated spending $500 or more on a beautifully decorated cake that nobody could see or notice because of lighting. That’s all changed. 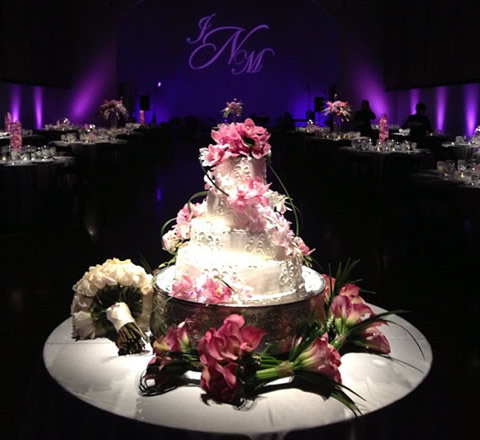 Ask about our new LED cake lighting option for your wedding. Cake Table up-lighting is also available. Want To Light Up Your Cake?